The Lightbox now has a substantial permanent display about Woking’s most important heritage site, the palace at Old Woking. 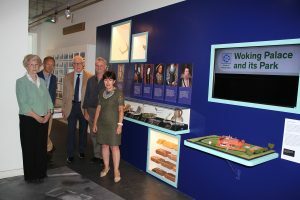 The new exhibition was opened last week in the presence of some 100 guests, including Jonathan Lord, MP, the mayor, Anne Murray and six former mayors. The exhibits on show and information at the Chobham Road site are thanks to the work of the Friends of Woking Palace (FWP). Funding for the display came from a grant of £300,000 by the Heritage Lottery Fund (HLF), which included excavation work at the palace. The exhibition gives information about palace, the history of excavations and discoveries at the site and examples of some of the historic items that have been uncovered. The FWP was set up in 2003 by Phillip Arnold to help Woking Borough Council with “the preservation and protection, upkeep and maintenance of Woking Palace and the advancement of education of the public in the history of the Palace site”. FWP runs open weekends each year, give talks and arranges special visits for local schools and groups. Richard Savage, of the Surrey Archaeological Society, recalled that it was almost exactly eight years ago that he and Rob Poulton, of the Surrey County Archaeological Unit, first discussed setting up a three-year project for archaeological excavations at the palace. He said that they could not approach the HLF until they had at least a couple of seasons work to demonstrate the potential of the site and their proposed approach. They needed to raise at least £20,000 for an initial three weeks of excavation in 2009 to be preceded by free geophysical surveys carried out by members of the Surrey Archaeological Society (SAS) and others. “The initial funders were Surrey County Council and Woking Borough Council, both wishing to support the proposed substantial community archaeology programme, and SAS. Three universities, Reading, London and Nottingham, came on board offering ‘pro bono’ technical services,” Mr Savage said. Simon Thurley, of English Heritage, admitted that he had previously been spectacularly wrong about the function of the ruined buildings. “In 1993 I wrote that it was a small hunting lodge. What utter rubbish,” Mr Thurley said. He said he later realised that the buildings were a “major residence, significant for a Tudor royal family”. Geoffrey Gower-Kerslake, a social anthropologist who regularly gives talks and guides at the palace, poured scorn on the theory that Lady Margaret Beaufort’s son, Henry VII, decided to demolish his mother’s old manor house and build a shiny new residence on the site. Mr Gower-Kerslake said there were other examples of Medieval and Tudor buildings had been standing side-by-side and spoke of his delight at being able to put one foot into the Medieval age and the other into Tudor at the palace.